Choose from Buffalo, Habañero BBQ, Kung Pao, or Honey Mustard BBQ. Served with blue cheese sauce or ranch. Additional sauces 25¢ ea. Served with pita chips & veggies. Seasoned, deep fried, & served with sweet & spicy chili sauce. Battered pickle slices deep fried with harissa aioli. With parmesan, garlic, & herbs. With salt & pepper or Old Bay seasoning. Creamy style slaw with cabbage, & carrots. Grilled corn with butter, chipotle powder, parmesan cheese, & parsley. Seasoned & sautéed in butter & white wine. Ask your server about today’s offering. Mixed greens, tomatoes, onions, & cucumber. Atlantic salmon over mixed greens with cucumber, tomato, red onion, & shaved fennel. Grilled beef burger over mixed greens with smoked bacon, cucumber, tomato, & red onion. Chicken breast served crispy or grilled over mixed greens with cucumber, tomato, & red onion. Cremini mushroom patty topped with guacamole and steak cut onion rings. Black bean & chickpea burger topped with minted cucumbers & harissa aioli. Marinated, all–natural chicken breast, seasoned, breaded, & deep fried, topped with habañero– infused barbecue sauce, bacon, pepper jack cheese, lettuce, & tomato. Atlantic salmon patty with toasted sesame seeds & ginger, house slaw, scallions, & wasabi aioli. Sautéed cremini mushrooms, port reduction, & aged Swiss. Sliced prosciutto, aged mozzarella, roasted red pepper, & sweet red pepper aioli. Topped with applewood-smoked bacon, American cheese, sliced tomato, & pickles. Topped with Monterrey Jack cheese, house barbecue sauce, & crispy steak cut onion rings. 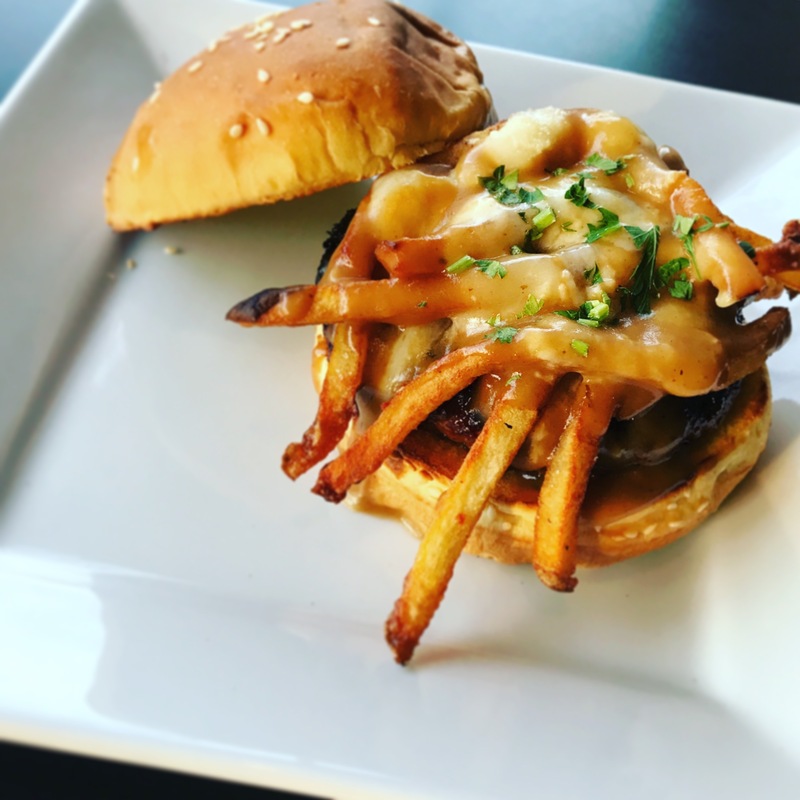 Crispy hand–cut french fries, brown gravy, & melted cheese curds. Choose from the toppings listed below & call it whatever you like! Served with lettuce, tomato, onion, & pickles . Served with lettuce, tomato, and sharp cheddar cheese. Add bacon for $2. Cooked pink or no pink. Big Apple - bacon, American cheese, pickles & tomato. With lettuce, tomatoes, and sharp cheddar cheese. Add bacon for $2. Grilled salmon filet served over mixed greens, with tomato, cucumber, onion, and fennel. Served with balsamic vinaigrette dressing. Traditional buffalo wings served with your choice of ranch or blue cheese dipping sauce. Casablanca – Vegan black bean/chickpea patty with minted cucumber & harissa aioli. Seasoned with garlic, parmesan, and herb mixture. Hand cut and seasoned with Old Bay seasoning or salt and pepper. Served with pita chips and vegetables. Tater tots served with Old Bay seasoning or salt and pepper and a side of harissa aioli. Buttermilk waffles or pancakes topped with fresh fruit and a dollop of butter. Served with syrup and your choice of one side. Plumrose ham, sunny-side up fried egg, and American cheese on a toasted English muffin. Served with your choice of one side. Creamy buttermilk waffles topped with fresh fruit and a dollop of butter. Served with syrup and our buttermilk battered fried chicken breast. Thin-sliced steak, with scrambled eggs, black beans, pico de gallo and pepper jack cheese with a side of our house made salsa. Served with your choice of one side. Scrambled eggs, mushrooms, black beans, guacamole, pico de galo, and pepper jack cheese with a side of our house made salsa. Served with your choice of one side. Grilled steak and Grilled onions served with two fried eggs cooked to order. Served with your choice of one side. Two fried eggs cooked to order and served with your choice of one side. Add cheese for $1.50. Cheddar cheese, onions, mushrooms, tomatoes and/or peppers, topped with our house-made hollandaise sauce. Served with your choice of side. With Salmon $13. With Ham $11. With Steak $12. Deep Eddy’s Ruby Red vodka with tequila, sprite, & soda. Served on the rocks in a tall glass. Cotton & Reed White Rum, pineapple, orange, and cranberry juice, topped with Myer’s Dark Rum. Myer’s Dark Rum & Crabbies Alcoholic Ginger beer. A classic drink with a bit more bite. Chacho jalapeño–infused aguardiente, Barritt’s ginger beer, & fresh–squeezed lime juice. Deep Eddy’s Lemon vodka, iced tea & a splash of Rose’s lime juice, served in a tall glass. Jack Daniels whiskey, Gran Marnier, simple syrup, soda, & a dash of bitters, served on the rocks. Sauza Gold tequila, orange liqueur, Barritt’s ginger beer & Rose’s lime juice. Served in a tall glass. Deep Eddy’s Lemon, Campari, Rose’s lime juice, & ginger beer. Served in a rocks glass. Play by yourself or with friends against other groups in answering a series of general science related trivia questions while building a high school level science project to test your engineering and critical thinking skills. Play for prizes and glory! $16 Sweetwater 420 Pale Ale pitchers! H Street's longest running LGBTQ+ Night featuring music by resident DJ Dezo, monthly guest DJs, and regular drag performances, theme nights, and more. Meet your LGBTQ+ neighbors and make new friends while enjoying $5 draft beer and rail drinks from 9 to 11 PM. 21+ / NO COVER / All are welcome! Host Mike Tanoory will run you through several rounds of trivia including a broad range of themes, two picture rounds, and one music round, before the final jeopardy style round to crown the weekly winner. Mike has hosted 200 plus trivia rounds at The Big Board and is sure to entertain! 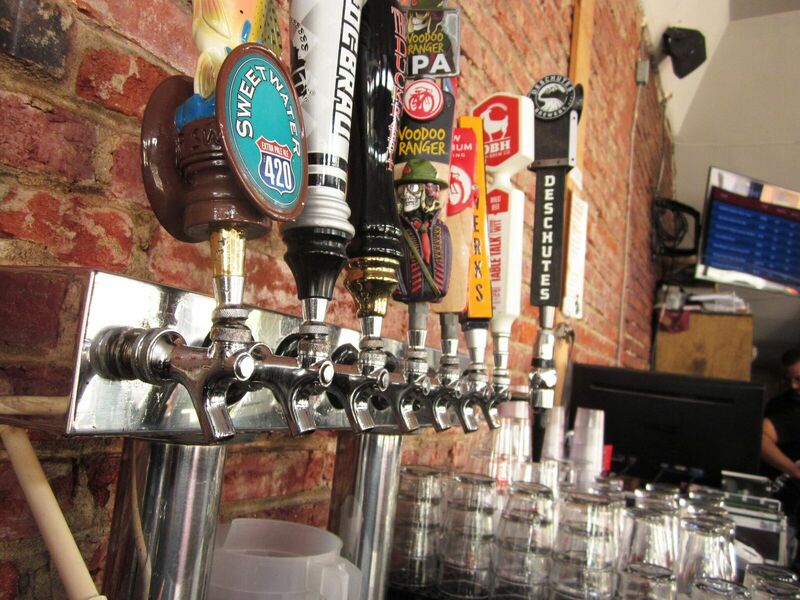 $18 New Belgium Brewery pitcher specials and prizes for the winners! ***Arrive early to ensure you get a seat. It fills up quick! 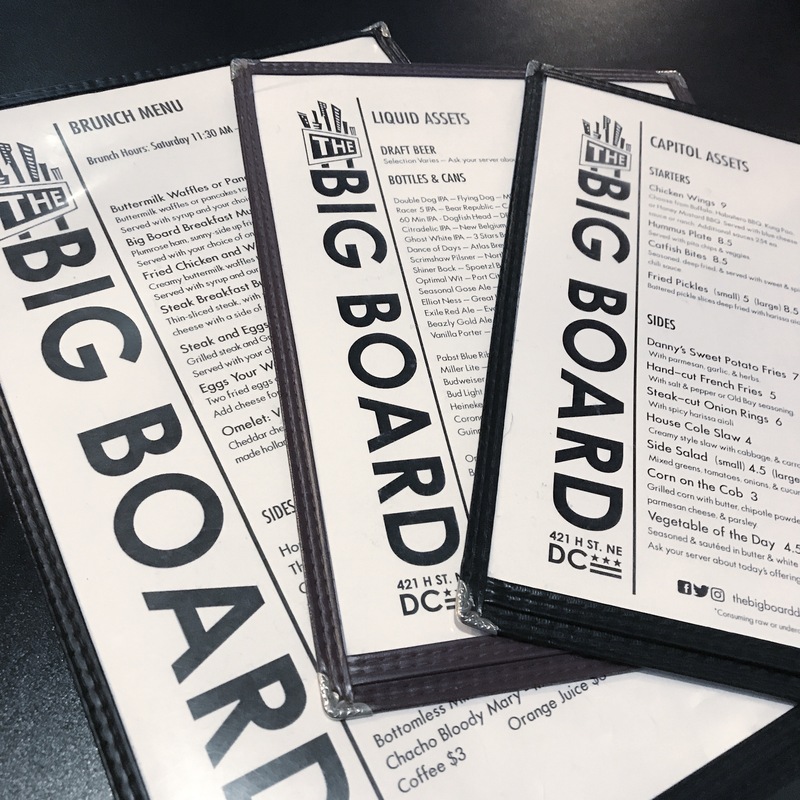 The Big Board has hosted private events and parties of all types. From Holiday parties, to baby showers, to game watch parties, we are happy to accommodate your event booking needs. We have a fantastic upstairs space that can be booked for larger parties as a private or non private space. We also offer buffet style food offerings in our upstairs room. Its perfect for your office lunch party or your big birthday / graduation / retirement celebrations! Please call us at 202.543.3630 to inquire about rates and availability. In 2011, brothers Mark, Eric, Doyle and long–time friend Dave realized their dream of opening their own neighborhood bar and restaurant. Drawing on Mark’s experience as a sous-chef in Montpellier, France, a menu was curated to deliver their unique take on gourmet burgers. To create a burger that truly set itself apart, the guys drew upon a family marinade recipe developed by the boys’ father, Admiral Flannery, who spent his career as director of the National Military Command Center. The boys and all their friends grew up eating and loving the Admiral’s burgers and his marinade was a perfect fit. The Admiral was always a bit of a gourmand though never one to follow a recipe; as a result, the brothers all have their own variations of the recipe, with each claiming to have, “the one that dad gave me!” You’ll find a variation of this secret recipe on all our beef burgers, but Admiral Flannery’s influence is still in each and every burger that comes out of the kitchen – as well as the welcome that we hope you all receive.